In this brand new screenshot that 4jStudios posted on Twitter yesterday night while i was watching Horrible Bosses 2 in the Cinema, you can’t see too much since the quality of the picture is really bad so my tip to 4jStudios is to next time make a better picture because the lighning in this picture is terrible. The only two things that i could see that are new are Wither Skeleton of which i already was pretty sure that we would be getting them and also the jump boost that are new and some stuff of which we already know that we will be getting them in TU20. On the signs in this picture which are really hard to read there’s written PS4, Hopper, Horse and PS4 again and as you can see is that on every monitor there’s Minecraft on a different Console. The Wither Skeleton is a mob that can only be found in the nether and is a little bit stronger and bigger than a normal Skeleton. 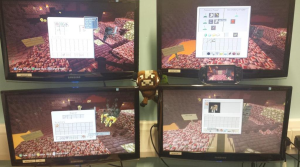 In the inventory’s on the different monitors you can see items and blocks of which i already talked about in my other videos so they’re not that special but if you havn’t watched my other videos about other screenshots then make sure you watch those. Again, we don’t know when we will be getting this Update but i don’t think that we have to wait that much long anymore. –qdengler – Gaming News!